In the four years since Sugarland graced us with The Incredible Machineit’s become abundantly clear that the project was the inaugural example of country music’s changing tide from a genre of integrity to one corrupted by an 80s rock mentality. As the first instance of the paradigm shift the results were shocking, but in context they make a little more sense. There’s no secret fans have been clamoring for a redo from the duo, but the fallout from still-pending lawsuits relating to the collapse of their stage at the Indiana State Fair in August 2011, where seven people died, have prevented their collective return to music. 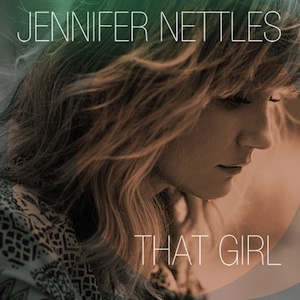 In the meantime, we have That Girl, the first solo offering from Jennifer Nettles; a project she says she’s been writing for the past three years. When the album was announced last summer I was excited, mostly because Rick Rubin was at the helm. Rubin, the man behind Johnny Cash’s American Recordings and Dixie Chicks’ spellbinding Taking The Long Way, knows how to craft complete albums better than almost anyone. So to say my expectations were unbelievably high would be an understatement. By all accounts, That Girl is a solidly above average album. Nettles’ songwriting skills are sharper than ever and she delivers one stunning vocal after another. But the ingredients just don’t add up, leaving the bulk of That Girl feeling lost and cold. More than nine years ago I fell in love with Nettles’ voice when “Just Might (Make Me Believe)” was climbing the charts and became obsessed with “Want To” when it led their second album two years later. There was a beautiful intimacy to those tracks that coupled with decidedly country production (fiddles, dobros, and mandolins) created an indelible magic that only got stronger with each passing album. That Girl retains the intimacy but is completely void of the country production elements from Sugarland’s best work. Seeing that this is a solo project, it’s unfair for Nettles to be expected to carry over the Sugarland sound. But Rubin has presided over an album that can hardly be called country at all, even by today’s standards. That wouldn’t normally be a problem but it aids in helping That Girl loose focus, and without a big standout track, the CD (as a whole) falls into a sea of sameness the renders the proceedings kind of boring. But I do like and appreciate some of the tracks on their own merits. I love the sentiment of “Thank You,” her co-write with Little Big Town’s Phillip Sweet. The acoustic guitar backdrop is sleepy, but the pair managed to craft a wonderful lyric about appreciation that’s both beautiful and endearing. “Good Time To Cry,” co-written with Mike Reid, is an outstanding R&B flavored number and one of Nettles’ best vocals ever committed to record. She also hits “Falling,” a number about loosing one’s virginity, out of the park. It’s also the closet vocally to the Nettles’ we’ve come to know and love. The sea of sameness is broken up a few times by some uptempo tracks, although none are overwhelmingly exciting. There’s a Caribbean feel to Kevin Griffin co-write “Jealousy” and somewhat of a hook, but the song gets a tad annoying with repeated listenings. Richard Marx co-write “Know You Wanna Know” succeeds on wordplay, and “Moneyball” displays the most personality from Nettles. The problem with the upbeat material isn’t the lyrical content but rather Rubin’s decision to make them feel too serious. Nettles has shown in the past she does better when she can be more playful (think “Settlin’” or “Steve Earle”). I really wanted to love That Girl a lot more than I do, as I’ve been unhealthily obsessed with Nettles’ voice over the years and have seen Sugarland live three times. This solo effort would’ve been a stronger listening experience if it had been more varied in tempo, with a few more hook-laden songs and less sameness balladry. If these songs were sprinkled over the course of a few albums, I bet we would’ve been able to appreciate them more. That Girl is by no means a bad album, but it’s not the transcendent project it could and should’ve been.